working while traveling a reality. south in an old Chevy van. The DOGBLOG reveals their current adventures. 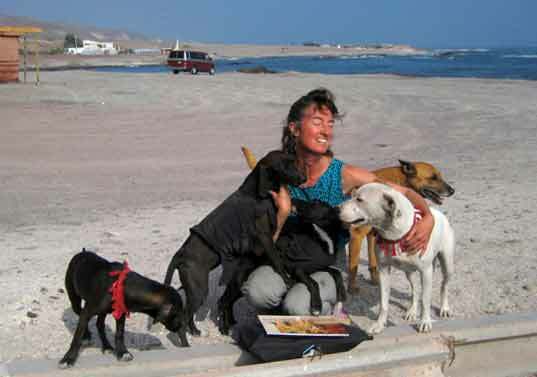 Lorraine, MamaD and her pups at Playa Blanca, outside of Iquiqui, Chile. Though I only knew MamaD for a month, I believe she discovered the Holy Grail of dogdom - human love and unlimited amounts of food, probably for the first and only time in her life. - photo Isabelle Guerrero. Sadly, while wandering the streets, I also saw many dogs who will never leave the compounds of their wire fenced garden. 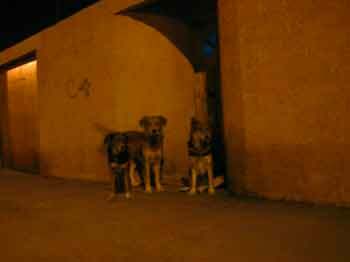 When I searched at nighttime when the traffic had lessoned, I came upon dogs who lived in their caged garden compounds in front of houses during the day, but were let out at night. 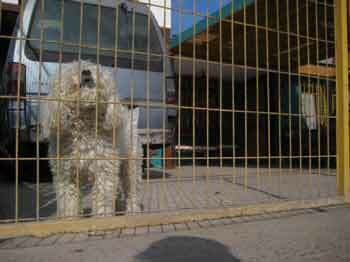 There were other dogs who led a life in reverse, caged at night, released during the day. Most of the time when I was searching, I left Dog in the van as I was trying to cover a lot of terrain on my bicycle. The van never left the spot on a street not far from where Bruiser had opened the sliding door and taken off. It was an area they both knew best in Iquiqui. While waiting for a response from Ronni Hall about where Bruiser might be, I took Dog for a walk on the beach. I believe getting away and taking a breather is a crucial element in recovering a lost pet. I laughed while watching Dog chasing after a golf ball. When I got Ronni Hall's email, I could then understand it more clearly. You won't be of service to your animal if you are tense. I found Bruiser at 4:30 a.m. the next morning, after him being missing two nights. He was 1 1/2 miles away from where I'd parked, and 1/2 a mile beyond the furthest point I'd searched. When I revisited this location a few days later, I was amazed to see everything Ronni Hall had mentioned and which are in the photo above and below; the grasses, which are almost foreign in this desert city, the high white wall, hot pink bougainvillea blossoms, a truck emptying who knows what into the sea, and a camp-like compound. 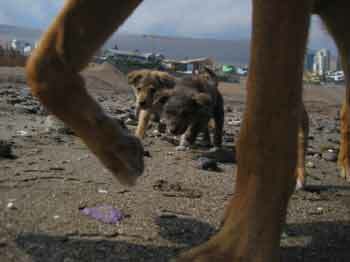 Also, was a litter of the next street dogs, or 'quiltro' as they're called here. Bruiser wanted nothing to do with them. How did the dream begin? Loosing an animal is a painful and frustrating experience. I'd like to share my experiences in the hope it'll help others in this situation. Bruiser is not an animal that's just gone off wandering. Each of the three times we've been parted have been unique situations, which initially seem dissimilar. The first time escaping from a new family in Kenya, in territory 1 1/2 hours from where he'd been a community dog his entire life. The second time jumping from the van a few miles from where we'd been camping in Costa Rica, scared by fireworks. And the third I feel, just thinking, I'm fed up with being stuck in the van while waiting for Lorraine, and managing to open the sliding door and taking off. One of the keys is to not give up and to do your best to quell panic, eat, sleep and make sure you're strong, so you can be useful for your animal. Time needs to be spent 'away' from the chaos. As Ronni Hall the animal communicator I used to help find him says, 'How can you hear in the middle of the eye of the storm?' The animal IS out there somewhere. It's a matter of putting your knowledge of the animal and terrain together with the information given you by the animal communicator and your pet. It's a three way process. In Kenya, because the terrain was so vast, my first priority was finding out if he was dead or alive. The first email from Ronni Hall confirmed he was. But every first email she's sent to me, has given me little information. It's almost like I need to get some initial searching out of the way. I'm guessing with Ronni Hall, the first conversation is like a conversation with any new 'person'. It's exploratory. And here's the important part. While waiting for her reply, initially I bicycled further afield. 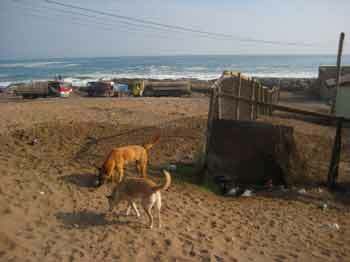 But I returned to the van, where Dog was sleeping, and we went for a walk on the beach with a golf ball. I laughed and loosened up. In Greek mythology after Persephone is abducted by Hades and taken into the Underworld, her mother Demeter is beside herself with worry. It's not until she meets another goddess who tells her obscene jokes, that Demeter is able to see the situation clearly, and answer clarifying questions. Such was the case when Ronni Hall replied to me. Here was the information I received from Ronni Hall: Bruiser's not hurt, but is tired. Sitting down. Was by some weeds. Something had gotten his attention - he showed me a hot pink flash he needed to check out. He told me different places have different smells and feelings and it can be very confusing, dizzying, hard to find your way and find center, balance. He is not down the cliff to the surf. By buildings. Camp? I saw a truck. There's a wall. Kept hearing a wall. Big white wall. Crouched down almost hidden. Afraid to come out. I'd like to explain that Ronni Hall has never met myself or my dogs. We've never even communicated by telephone, solely by email. In-between the times he's been missing, we've shared a few emails where the topic is publishing. But that's all. She doesn't know who I am as a person. I have no ulterior motive to publicize or promote her. 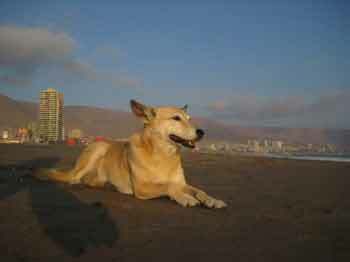 Her speciality is not locating missing animals, but other areas of the human/animal bond, but she's assisted me in locating Bruiser three times, on three different continents. This time, I was in a city with lots of traffic. I waited less than two hours before contacting her. You'll be given advice by people. Listen to it. But also realize, no one knows your animal as much as you. Every time Bruiser was missing someone would say, 'He'll be near markets, restaurants. A food source.' As much as Bruiser lives for food, that wasn't the case any of the three times. Each time, he fled away from areas inhabited by lots of people, because despite his bravado appearance, he is leery of strangers. Despite going to bed early, I couldn't sleep from excitement that the next morning after receiving the clues from Ronni Hall, that I'd find Bruiser. This is an important mental key. You're going out to FIND your animal, NOT search for them. You could SEARCH for years. You will FIND only once. I slept until midnight, and dosed for the next three hours. Just after 3 am I sat bolt upright. I'd finally drifted into sleep, but now was not the time. I wanted to go out into the city when the traffic was at a minimum. I was ready in five minutes and headed away from Copec and town, and the areas I'd been searching. I had one crucial clue in Ronni Hall's email. "He is not down the cliff to the surf." That meant, I'd been searching in the wrong area entirely, as the area around Copec was only at a slightly higher elevation than the sea. So he had to be further south. For reasons I don't know, I knew he wasn't north along the coast, and though I'd searched east towards the sand mountains, I hadn't gone beyond a certain street, as that didn't feel right either. This new information narrowed the search considerably. The other clue was the high white wall. Just over a mile south, was a very long wall, dividing houses from the busy four lane highway that ran alongside the ocean. But as I approached, I knew it wasn't the right one. In fact, I hadn't realized until that moment, how many high white walls there were. I fought off frustration and fear and the feeling that though I had these clues from Bruiser and Ronni Hall, the legwork was up to me. It still seemed a daunting task. When Bruiser was lost in Kenya, the first clue she gave was 'tall grasses'. Panicked, I was angry and thought, 'Well, that narrows the search down to most of Africa!' I wasn't angry this time, but this was a perplexing clue. Iquiqui is a desert city. Weeds don't grow and flourish in sand. But the only weeds I'd seen were in a few badly maintained parks. Ronni Hall mentioned a camp, (with a question mark) and a truck. I knew that this must mean a construction site - a wide sprawling space with some activity. But as I drove south, there seemed to be very little construction in this area. I passed an Esso station. This was one of only three gas stations I'd gotten gas after arriving in Chile. 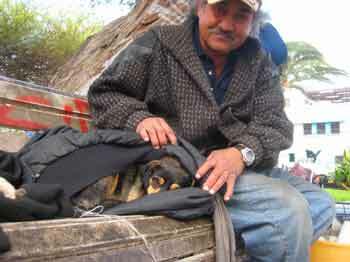 At each one, I'd met men who cared for dogs. This one was no different. I'd thought of stopping there before, but didn't. It was almost half a mile beyond the marker I'd mentally set. I headed further south than Esso, and got out a few times with and without my bicycle and called in areas where there were white walls or construction going on. But never weeds. And none of the places felt right. I tried another place which had large expensive home overlooking the ocean and called Bruiser's name, loud as always, completely uncaring if the Gringa looking for a dog at 4:30 in the morning woke anyone up. Nothing. Just my voice echoing off the walls. I came to a huge pile of dirt that must've been delivered for construction purposes. I needed a pee. And I needed to think about where I'd go next, as I was now returning north again, and the cliffs weren't very high. Squatting with pants down, I contemplated the dilemma of where to go next. And suddenly a dog came out of nowhere. In front of me was Bruiser. As with the two times before, it was a surreal experience to have what seemed almost impossible to attain - a reunion with a beloved animal - there in front of me. The fantasy became a reality. He whimpering excitedly and circling me again and again, and me struggling to pull up and zipper my pants. Not exactly a Kodak moment, and if a film was ever made, that scene would certainly be altered. Though the emotion would not. And then, he walked away and into a construction area. He was wanting me to follow, so I did. 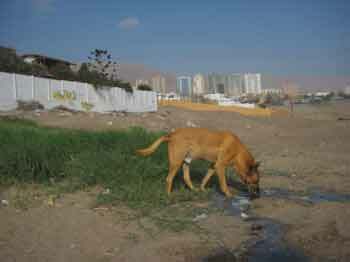 As with the first time I tried to find him in Kenya (I hadn't lost him, as he was not yet my dog - you'll hear this story in On a Mission from DOG), it was clear that he had spent much of his time hunkered down, as all the smells on this little avenue were new to him. This was confusing to me, as wasn't this where he'd been spending his time? A few days later, we returned to this spot. When I stopped the van, Bruiser looked at me with eyes wide with horror. What was he thinking? When it became clear we were going to walk here, he was excited and eager to explore. A new daytime world was revealed, one I hadn't seen with my poor night vision. A high white wall, some of it covered by hot pink bougainvillea blossoms. Was this the hot pink flash he'd wanted Ronni Hall and me to see? We continued down the drive past the construction site in the direction of the sea. The scene awaiting me was incredible. Another high white wall, this one with graffiti, and below that, an area of at least twenty square yards of more grasses and weeds than I'd seen in all of Iquiqui. Lush and green, fed by run-off water. His water source and the weeds Ronni Hall had said he was hiding behind. Further down, closer to the ocean, was an area fenced by netting which looked like a camp of sorts and beyond that, about five trucks, all pouring something via hoses into the sea. The remaining clues. The morning we were reunited, we walked back to the van and I gave him food and water. The next priority was letting Ronni Hall know he'd been found. We drove back to the Copec station which has wifi and is open 24 hours. But there was a bigger priority. A walk to bring the three of us back together as a pack. Now 5 am, the traffic was much less. And since it was a holiday, there wouldn't be the normal rush in a few hours. So we roamed through streets I'd searched for Bruiser, over to the supermarket which they'd only explored a little before and after I'd shopped, and then a huge empty lot which had been home to a circus the past weeks. All before dawn. A joy and one I didn't allow myself often enough, too often saying to them, "I'm too busy, another time, I need my sleep, I have work to do..." Certainly, we walk everyday, but too often it's not the walks they deserve. There was a more personal part of Ronni Hall's e-mail that needed exploring. She wrote: He got very serious and said he had conflicted feelings to tell you. The effect of the travelling to different places has gotten very hard on him. The unfamiliarity in his life right now is very stressful. He wanted me to relay this to you in the best way possible and was very concerned how you would take this as it is what you do. He wants to stay put for a while. He needed your attention right now. He says you'll find him but you need to hear this message. He's tired. The message hit home. Bruiser IS tired, and has been for some time. I'd wanted to e-mail Ronni Hall about this previously, but there always seemed to be other priorities. I'd expected to be in wild country where they could sniff and chase wild animals long, long ago. I never dreamed it would take so long to get there - a combination of working while traveling, and putting so much time and energy into On a Mission from DOG, that I had no time or energy left to pursue money producing articles which would let me head south with enough gas money to make faster progress. How long had I been promising them, "We'll be there soon. 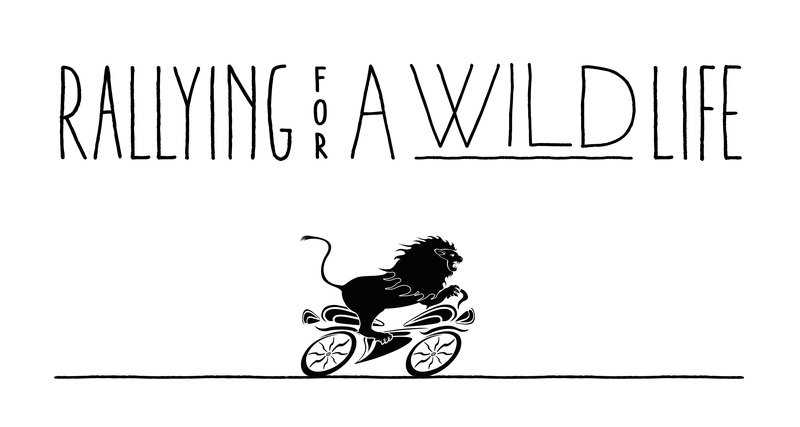 Just one more week..." But the wild places I promised, never appeared. Certainly we'd experienced some amazing and wonderful places. But not what would make them the happiest - or me. Having these two dogs accompany me wasn't just about companionship. We had a firm partnership. I wanted them to be as happy as possible. I've promised them for weeks we'll be leaving 'in a few days'. I'd been side-tracked by a mother dog and three pups, finishing On a Mission from DOG, as well as a delayed magazine payment, which was preventing me getting brake work done. My plan is as soon as the money comes in, (any day I've been promised), we will head south, then east into Argentina where money will buy me more gas, and then head south until we reach those mountains, grasses and wild places. It's long journey, at least 35 hours. At that point, I'm committed to either camping for months in one place, or finding a little place to rent. In the coming days, a few people asked where I'd found him. When I replied, 'Near the Esso station,' they all had the same reaction. 'That's not far,' as if to imply, it all made sense, and therefore, an easy search. Easy to say in hindsight. Though Iquiqui has vague boundaries, like many cities, it is still a maze of streets, obstacles, and dangers. And I was searching in the wrong places. If using an animal communicator such as Ronni Hall isn't appealing to you, as a preventative measure there is also a device called Global Pet Finder which uses a GPS tracking system. It doesn't work in S. America, but it might in your area. 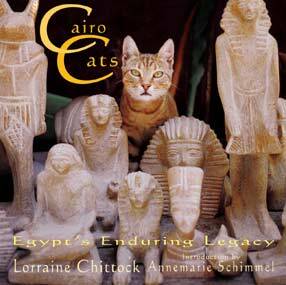 And if you loose your animal and want to contact me for any reason, please don't hesitate to e-mail.